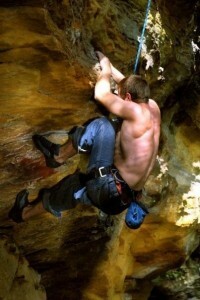 Your source for all the local information about climbing in Oak Park at Grand Ledge, MI. Guidebooks, clean-up days, local information, and more can be found all in one place. Join the forum to be kept up to date with news and events. As one of the few places to climb on rock in Michigan’s Lower Peninsula, Oak Park is wonderful small public park owned by the city of Grand Ledge, MI. The park contains a long cliff that lines the Grand River. The cliff is 20-30 ft tall and contains well over 100 routes. Rappelling and lead climbing are not allowed, but there are plenty of top rope routes and boulder problems to keep you busy. Who can climb at Grand Ledge? Oak Park is a city owned public park, and climbing is open to anybody. There is no guidance, equipment, or instruction provided. Climbing is at your own risk. Climbers are required to bring their own equipment. Top rope anchors are not provided, climbers are required to setup their own proper top rope anchor systems with adequate protection for the rock. There are several commercial guide services who offer lessons and guided climbing within the park. Several schools and clubs use the park for group outings.